I've been ignoring the US spellchecking on flickr for ages now, but I've just realised the spell checking is actually being done by Firefox (according to flickr). I have the GB language pack installed along with the GB dictionary - no other. I've tried disabling all add-ons but it still checks to US spelling. Oddly, it only seems to do it for flickr, so I'm scratching my head here. Any help appreciated. Does it happen on any other sites, besides flicker? Not sure any of this is going to help... but in Options/General ... and in the Language area... what shows up when you click on that Choose button? ... if it shows EN-US maybe that is confusing Firefox or those extensions... when you click on that part of what is displayed is "Choose a language to add" ... maybe adding GB helps? BUT... if I were you I'd have a test profile in there with that GB stuff added and then make that change that I mentioned. Always helps to have that Test profile laying around for checking this stuff out... keeps you main profile from getting killed... know what I mean? tomatoshadow2 wrote: Does it happen on any other sites, besides flicker? No, it doesn't. Which is why I'm puzzled. dfoulkes - the language is English/United Kingdom [en-gb] - no other languages is in there. I also have Marco Pinto's British English Dictionary and the English (GB) Language Pack installed - no other languages. Still, color is considered correct and colour incorrect. BTW, the spellchecker is working correctly here. The same question was posted at Flickr but the poster was told that as Flickr does not have a spellchecker, it's down to the browser. So this seems to be a Firefox problem. A colleague at Flickr doesn't have this problem. I can ask what browser he uses but I don't see how it will resolve my problem unless I intend to change browser. Not knowing how those packs are installed in Firefox... and if they are add-ons... were they left active when you did the top quoted line item? You can also try this to see how it goes... create a test profile and add what you need with respect to spellers/dicts... then check out how it functions. And,.... DON'T TOUCH THAT "Choose Folder..." BUTTON! ... unless you fully know all about it. dfoulkes wrote: ...were they left active when you did the top quoted line item? They were manually disabled. But surely "Restart with Add-ons Disabled" does just that anyway? Come again? You don't know about language packs? FWIW since you noted that your GB spell checking works on all sites but flickr, I woud suggest there is something amiss with the flickr site. However, since I don't have a flickr account I have no way of verifying that. FWIW since you noted that your GB spell checking works on all sites but flickr, I woud suggest there is something amiss with the flickr site.. I've just visited Flickr using Edge, and it correctly offered GB spelling without even having to set the damn thing up. So the problem seems to be how Firefox reads their site, or how Flickr reads Firefox, or both. You don't need to have a Flickr account to check this. Simply go here - https://www.flickr.com/photos/160898078@N03/41484268301/. Go to the Comment box below the picture and type two words - "color" and "colour". Don't do anything else, just tell me which one has the wiggly line under it. I added the GB dictionary to FF. I then went to the comment box at the flickr URL you provided and typed in color and colour. Since my default is the US dictionary red wiggly line was under colour. Changed the default to GB dictionary and the red wiggly line was under color. Strange. This doesn't make sense. So how can FF here suggest the GB spelling is incorrect when it's the only language pack installed? Just done the same on my wife's laptop and the spellchecker doesn't even work! Last edited by storm_the_dog on May 17th, 2018, 2:29 pm, edited 1 time in total. While my cursor is in this box and I right click a menu opens and if I go down it shows under languages the two dictionaries I currently have installed. Yes, safe-mode disables all extensions... and more... the reason I asked was that if you disabled them it seems to me that you would then have no extensions related to what you are trying to get? ... understand?... or maybe I'm looking at this wrong. I know of the packs... I've just not needed them and don't want to install anything in here which may affect my 'perfectly' running profile. Also, I don't see where tried that new test profile ... especially since others have test for your problem and have no issues. A test profile is one of the basic and first things to test out with...along with safe-mode. Robert, you've nailed it! If I go to the Flickr page and right click in the Comments box I get the same choice of languages. It was set to English (United States). I've set it to English (United Kingdom) and it's now working perfectly. Thank you! 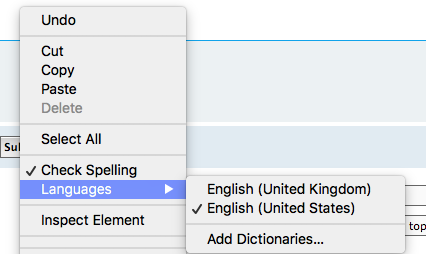 Doesn't explain why English (United States) was an option when I've removed it though. dfoulkes - the reason I didn't try the new profile option is for the same reason you didn't wish to install the GB language pack - I didn't wish to upset my existing profiles, knowing how techy they can be and how they don't appear to be supported as they once were.